The number, of course, depends on a number of factors. But let’s first look at a picture bigger than just your organization. Web and video conferencing is used for a lot of use cases, but marketers using it for lead generation webinars and webcasts is what shapes public opinion – they’re reach is broad and visibility high. But what do marketers get measured by? Overwhelmingly it is NOT how well the presenter does by getting attendees to take some desired action. Instead, they all get measured by leads. Now take a look at the header graphic. For years marketers who don’t get measured by throughput have been communicating to the world that a live presentation is all about content and there is nothing unique about being there live. Would anyone accept this for an in-person event? Of course not. But the message to world – including the people you are trying to reach – has been that a live webinar is no different than a recording. And we wonder why so many register knowing they’ll never show up? Industry maturity. More mature industries have been getting this message for longer. Besides laggard industries, there are some segments where there are pockets of potential attendees who attend educational events as part of their job rather than competing with all the meetings on their calendar (I’ve seen this in government, pharma, and several others). Target audience. Some segments such as IT already are used to searching for on-demand information, and their attendance rates tend to be lower. How you’ve been messaging. Have you conditioned your own audience that it doesn’t make any difference if they show up to the live event? When you hold events. The industry standard for years has been that webinars are held early or mid-day on Wednesdays, Thursdays, and Tuesdays (in that order). But that’s a hold over from when people do conference calls. You might find that getting outside “primetime” will help (not unlike how TV networks used to plan time slots). Type or context of event. “How to” has always been the most attended type of event because, presumably, there is a direct expectation of value-derived. Marketing or thought leadership? Less so. Is it internal to your organization or extended partner network? That’ll be different than a cold invite out to an unknown audience. Paid or free. Most webinars, webcasts, and virtual classes are free, obviously. If someone has paid for something, they’ve got skin in the game and almost always attend. It’s not wrong to make a recording. You should. (duh!). But if you’ll spend a little time contemplating how you make a live event something worth showing up for (like you would for an in-person event), you’ll also find that your messaging now has the seeds of differentiation. In other words, plan a different experience, and you’ll know what to talk about. Most importantly, forget what the broader world is saying and doing (unless your market is the whole of the broader world). Start doing your own program-level benchmarking and testing. You might be surprised at how trying other webinar planning tactics will payoff. P.S. The use of on-demand content is a key part of your overall program strategy. 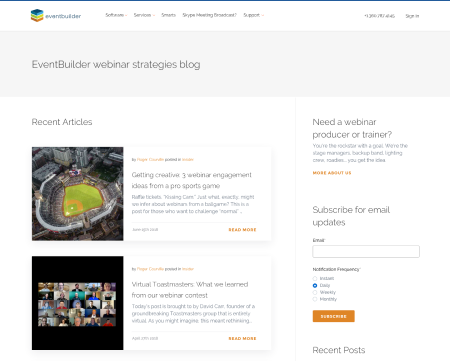 It’s why EventBuilder dedicates one of our four modalities to it and lets you upload other video assets to your Portal. Need to instantly scale your webinar production team? You're the rockstar with a goal. We're the stage managers, backup band, lighting crew, and roadies... you get the idea.